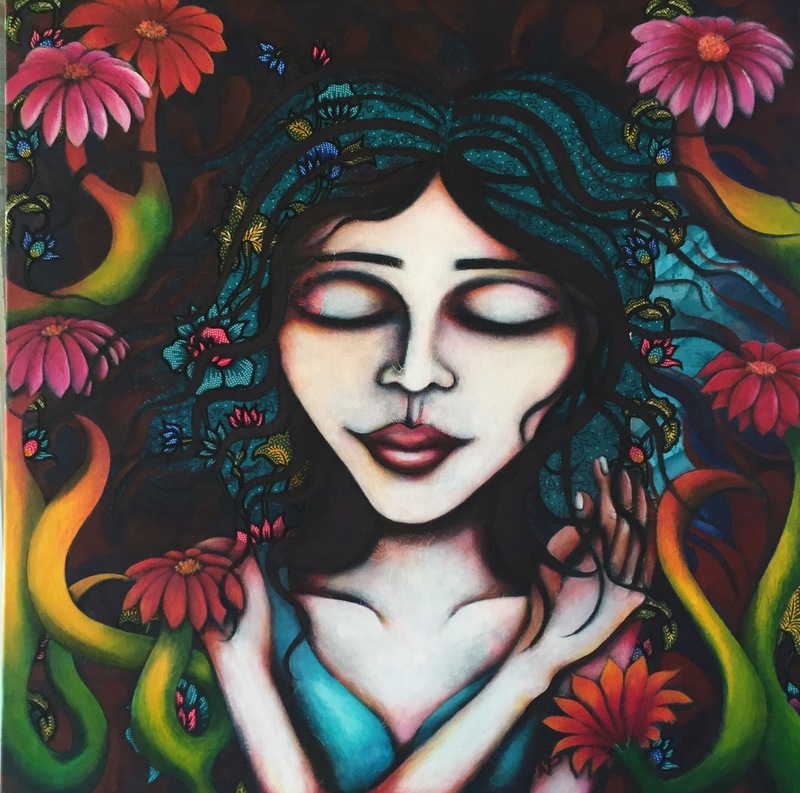 It’s been a lot of hard work creating the paintings for my latest exhibition, “Abundance” This is the third year in a row that I’ve done a major exhibition and I can’t count the number of group shows and art prizes I’ve entered over the same period. The opening was a fantastic success! Lots of friends and family and a growing number of new faces supporting my artistic journey. It was also wonderful that some pieces were snapped up on the opening night! Love and thanks to everyone. 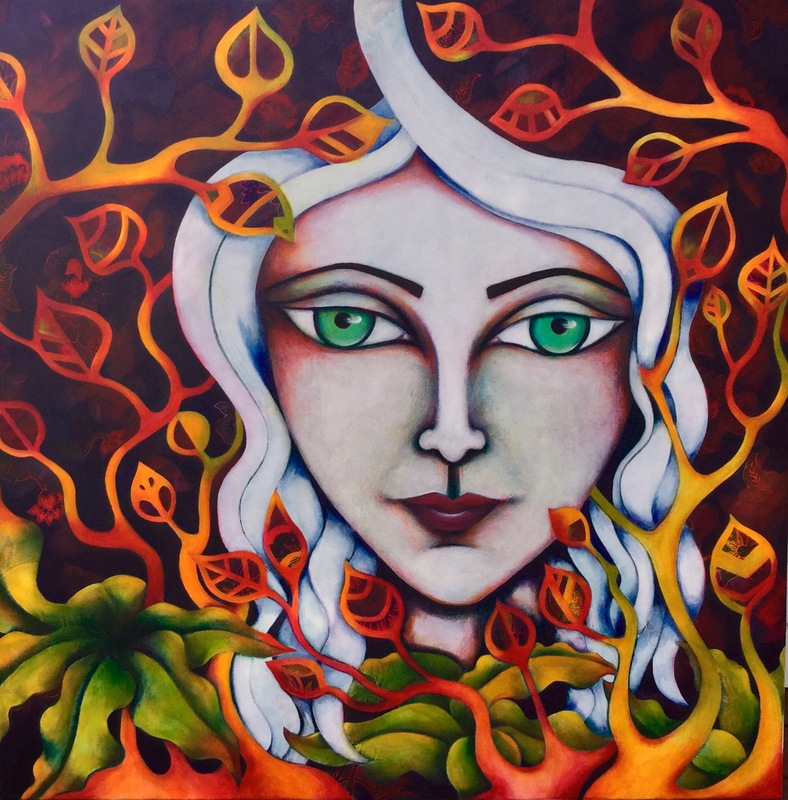 Abundance is on until the 7th of December at Gallery 503, 503 Balmain Rd Lilyfield. Well I’ve payed the deposit, so it’s official! I’ve booked a solo show for November 2017 at Gallery 503 and am painting away with themes and exhibition titles bouncing around in my head. Titles are jockeying for position, but I think as I assemble a body of work, the final winner will become obvious. I’m also involved in an exciting group show as part of the Inner West Council’s studio trail in May. Add in a bathroom renovation, three kids, an aging mother and a trip to Indonesia for inspiration and I’d say I’ll be kept pretty busy for the next few months. I’m still trying to organise a show in Melbourne for this year too, but logistics and the tyranny of distance are hampering progress. If anyone has any ideas of suitable galleries or knows anyone who may want to team up for an exhibition, I’d love to hear from you. 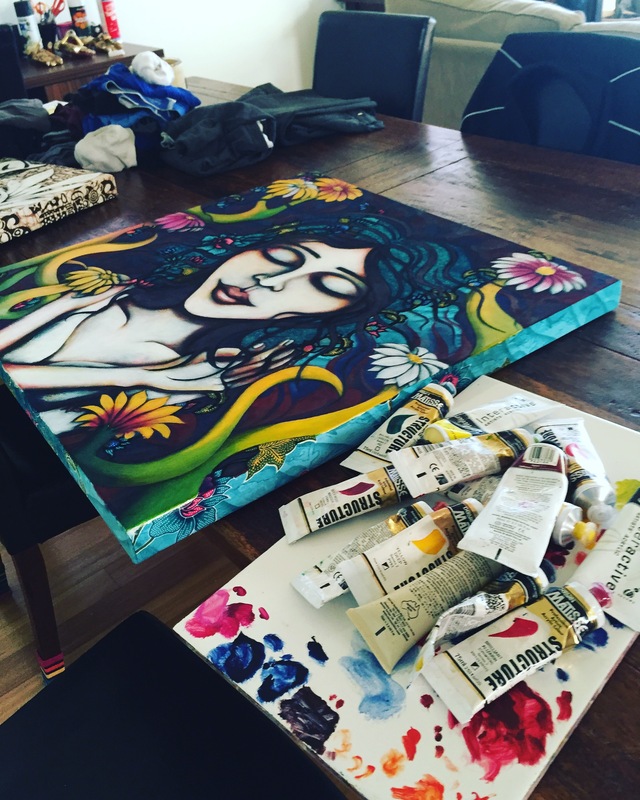 It’s always tricky juggling life and family commitments with the need to create. I find it hardest in the long Christmas school holidays. I love my kids to bits and really enjoy the more relaxed holiday mode, but by the end of six weeks of entertaining and endlessly feeding and cleaning I really miss painting! By the time the holidays are done, I’m so out of my creative routine that it takes a concerted effort to get back into gear. There’s really no other way to do it other than just jump in and work. It doesn’t matter if what I’m creating is not my best work, it’s just important to get started, to get back into the flow and discipline of painting. It’s stinking hot here in Sydney, (AGAIN) way too hot to be in the studio, so I’ve moved indoors with the aircon. Hallelujah!!!! Here’s what I’m working on at the moment. Keep Sharing the LOVE ! Merry Christmas to you all! I hope love and kindness have been gifted to you this year and that you continue to share these gifts with others in the New Year. I am proud of these beautiful paintings both for their success in exploring my theme of the existence of the divine in all things and also for the progress in my painting practice that they showcase. Please click on the menu on my home page to select the Immanence Gallery page. I’m working on posting all of my paintings from my latest exhibition “Immanence” in a new gallery on this website. I’m not done yet, so I thought I’d post a few pieces here on my blog. The show was a huge success in so many ways. There are some pieces still available and I’d be happy to provide prints too if you’re interested. Apart from the themes I explored in this body of work, that I have already mentioned in a previous post, I’ve been working on developing the way I depict my faces. I’ve always been obsessed with eyes in particular and faces in general. I cant tell you how many times during my schooling I had teachers swoop down on me, tearing pages from my hands and accusing me of not listening! The funny thing was I always was listening and could tell them exactly what they had been waffling on about. Even in a work environment I would always draw during meetings and training sessions. Far from distracting me, it seemed to be the only way I could stay focused! I’m really happy with the way my work is developing. I have no interest in depicting people or objects in a realistic style, but I did want to add more depth and texture to my work and on that front I think my work is coming along nicely. An exhibition of my new work entitled “immanence” opens on the 19th of November at Gallery 503 from 6- 8 pm at 503 Balmain Rd Rozelle. The show is on till the 29th of November. Pop in and say hello. I have an upcoming exhibition with fellow artist Lynore Avery. 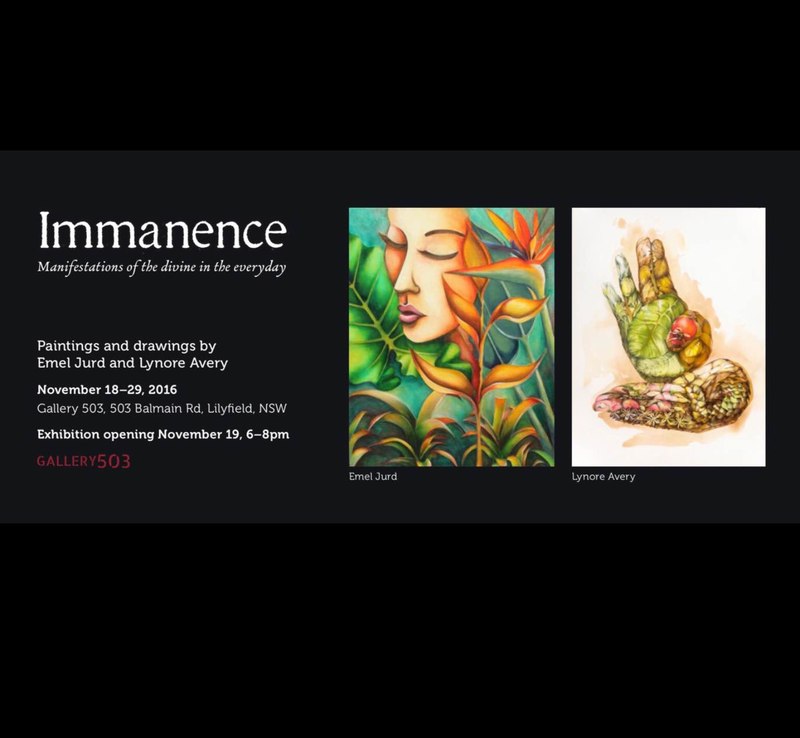 The show is entitled “immanence” which in a nut shell is the existence of the Devine in all things. My paintings in the show are on fabric on canvas collected from my travels overseas in the last few years. Fabric seemed to be the perfect metaphor for exploring the interconnection between all things; the fabric of the universe. 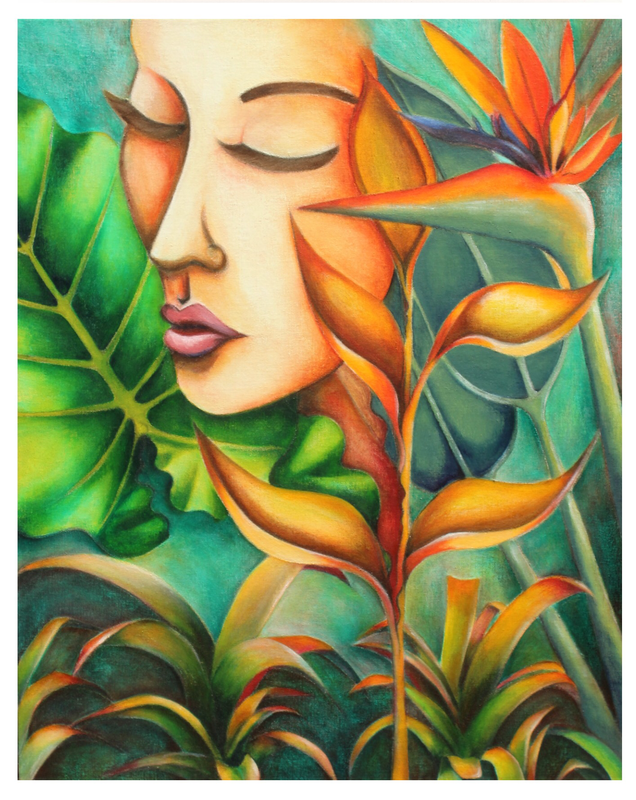 The works are layered and vibrant, as is my way and reveal more of the themselves the longer you look. I love how shadows or glimpses of Thai or Indonesian fabric can be seen, but are mostly obscured by layers of paint, colour and line. Faces rest in reflection, or gaze directly at the viewer hinting at hidden emotions. Plants from my yard also plays a prominent role, some true to form and others altered to create skeletal structures, through which other layers of colour and design can be seen. Opening night is the 19th of November from 6-8pm. Details are on the invitation below.please come along, I’d love to see your lovely faces.